Graphixscan 500 high speed galvo Laser cutting and engraving machine As well as being able to cut appliques for embroidery, the Graphixscan can control its power so precisely, it is able to cut only through one layer of fabric leaving the material underneath untouched, this allows for the creation of pre-stitched appliques to be cut whilst still in the embroidery frame. Simply attach your existing embroidery frame carrier to the cutting bed and you will have perfect registration every time. The Graphixscan laser engraving machine combined with our own laser engraving software, enables an image or vectors to be laser engraved onto fabric and other materials, at very high speed. Variable power and speed and focused laser beam are Ideal for engraving designs or wearmarks onto denim jeans. We offer engraving area sizes from 250mm x 250mm up to 2300mm x 1500mm with roll to roll capability. Images, text, logos and textures can be engraved into a variety of materials at lightning speed and with precision every time. Laser cutting is also possible on many materials including, leather, denim, polyester. 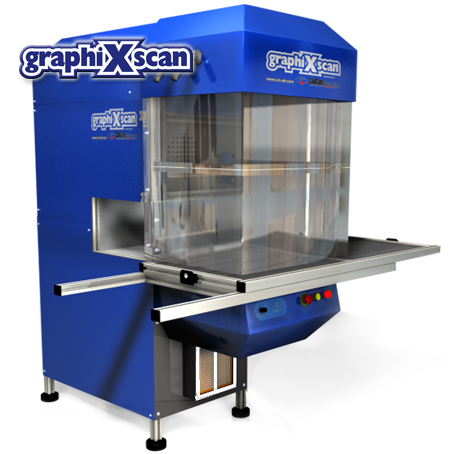 The GraphixScan is a truly versatile machine. The Graphixscan lasers are controlled by our advanced laser marking software giving total control of speed and power, which allows the user to etch and cut to precise depths. Popular image formats such as bmp, jpeg and Tiffs can be imported and vector formats like ai and dxf. When you purchase a laser machine from CadCam Technology Ltd we automatically include installation and training.